In 2017, The RSA government reduced the annual sardine fishing quotas by 50% nationally. 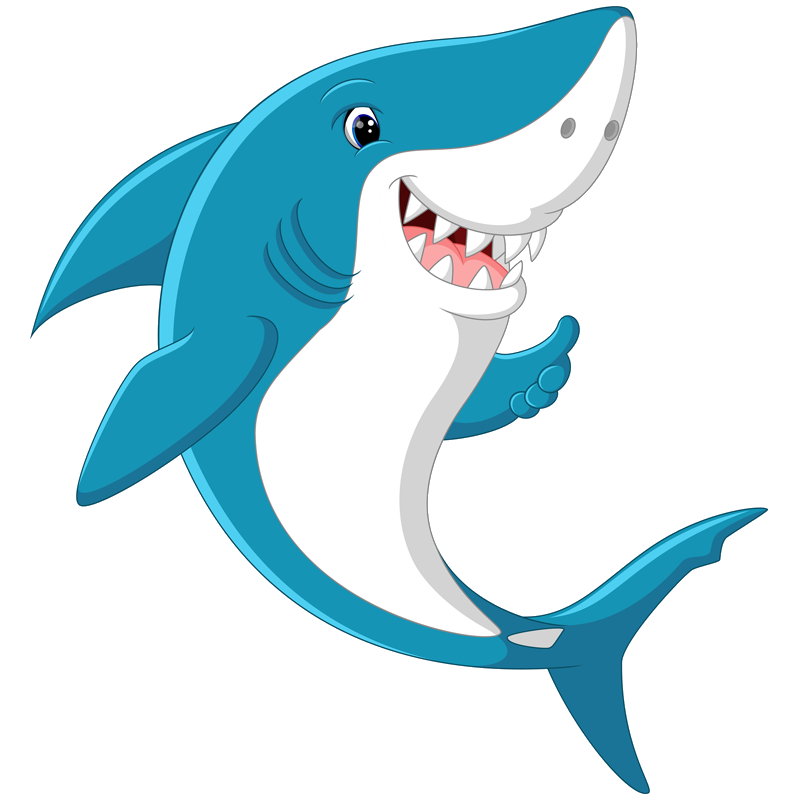 This has resulted in a resurgence of the sardine stocks and the resultant reemergence of the sardine run as one of the greatest marine events on the planet. When predators meet prey, a feeding event of unmatched proportions begins. 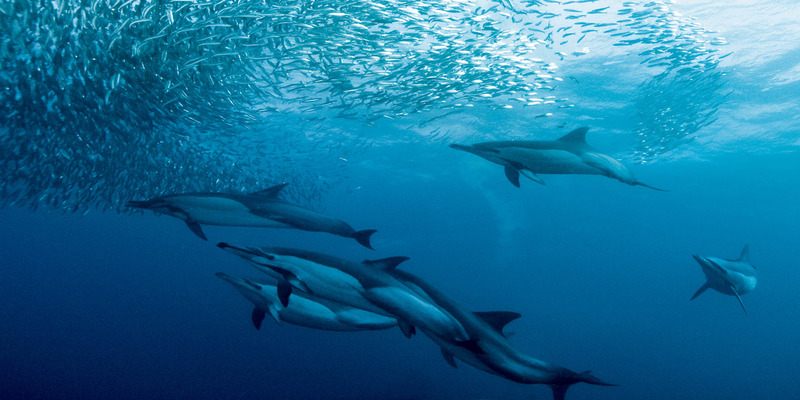 Thousands of common dolphins charge after the shoals, separating them into densely packed bait balls and driving them to the surface. 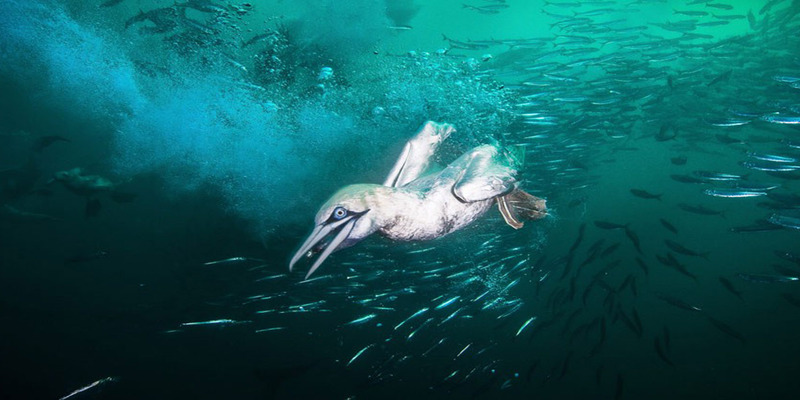 Watched by the omnipresent Cape gannets, an aerial assault on the sardines occurs when tens of thousands of gannets begin their spectacular plunge diving displays. Below the birds, the bait balls are easy pickings not only for dolphins, but also for shivers of bronze-whaler, dusky and blacktip sharks. The final player, is the behemoth Bryde’s whale. Its huge mouth can decimate an entire bait ball in a single lunge. 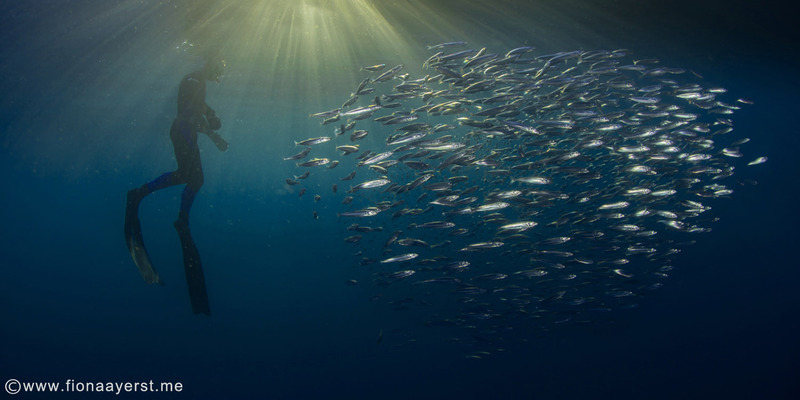 In the late 90′s, Blue Wilderness pioneered diving expeditions to follow and film the Sardine Run. We were instrumental in epic productions such as the Emmy Award winning BBC film “The greatest shoal on Earth”. Today our team continues to annually track the Sardine Run. We are always developing new detection technologies; perfecting our observer network and retro-fitting our vessels to ensure we can again experience the world’s greatest marine event. Where can I learn more about the Sardine Run? Can I come for shorter trips? From our experience running sardine run expeditions, we know that this duration of expedition will maximize the probability of success. 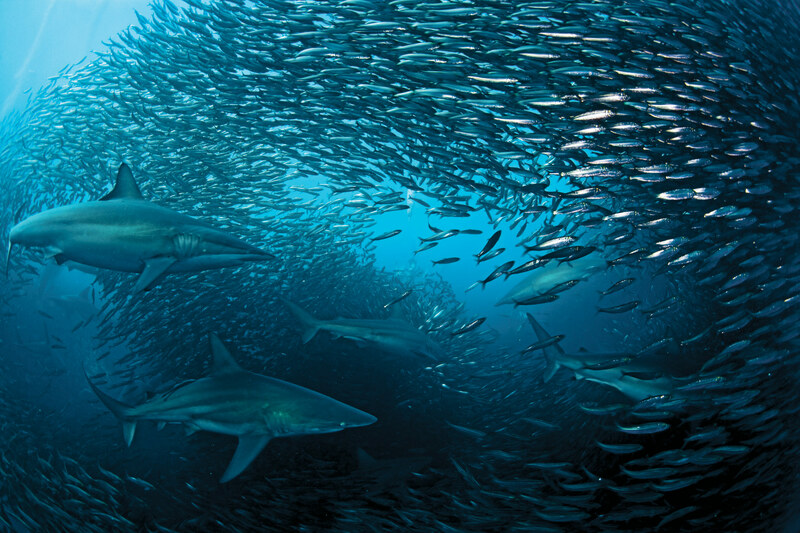 Coming for a shorter period exponentially increases the probability that you will not experience the incredible sights that the sardine run has to offer, due to the difficulty of locating great bait balls and the possibility of bad weather spells. Thus to ensure that we feel morally comfortable that we can deliver the promised service, we do recommend that guests join us for an entire expedition. How 'Tough' is the Sardine Run? The Sardine Run is tough, and anybody joining us on an expedition should have a relatively good level of fitness and be used to spending time on the ocean. Spending 8 hours a day on a small boat is challenging for even experienced ‘seadogs’. Blue Wilderness has made a great partnership with three accommodation providers in East London, South Africa. 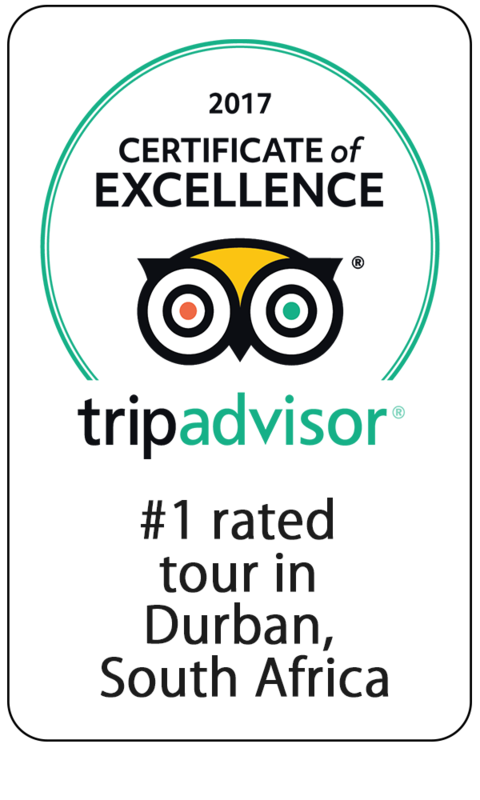 The lodges we select are all three to four star quality, and have been personally assessed to ensure that they meet the level of service for all our sardine run guests. Blue Wilderness will pick you up and drop you off at East London airport – South Africa. Bad weather is an unfortunate reality on the Sardine Run. The wild coast of South Africa got its name for being, well, a little wild (weather wise)! Thus it is likely that we will lose a day or two on each expedition to bad weather. We keep a ‘floating’ reserve day for any bad weather days, and spend such as day enjoying nature and sites around East London. If there are more than one bad weather days, then it is up to you to decide what alternative activities you would like to do. Maybe a trip to the mall or relaxing on the nature farm where we stay? Unfortunately, Blue Wilderness is not able to offer refunds on additional bad weather days for this expedition. Nothing beats great grub before , during and after a hard day on the sardine run! Our lodges cater for all our eating requirements, and ensures we are well fed and happy at all times. The food is homemade, and most of it is grown and produced locally. Meals are a fun social event around a communal table and open fire. On the water, a assortment of high energy snacks and drinks will keep our energy up throughout the day! If you have special eating or dietary requirements, simply let us know in advance, and we will arrange suitable catering for you. Can I bring my large DSLR camera and strobes?